Who: Today’s guest is Aubrey Marcus (@aubreymarcus) the founder and CEO of ONNIT. A nutritional supplement and holistic health provider based on his philosophy of Total Human Optimization. 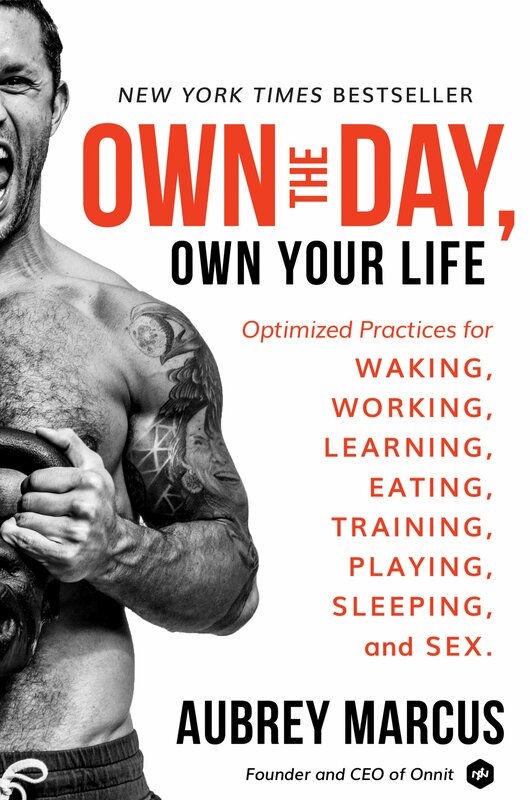 In this interview, we cover his awesome new book, his life philosophy, Onnit and how you can learn to Own the Day to Own your life. For others, I am particularly loving the Tribes of Mentors book by Tim Ferriss, Ross Edgley’s awesome new book ‘The World’s Fittest Book’ and some super soft, super comfy and gain showing jeans from Barbell Apparell. Use ‘NEXTLEVELGUY‘ at the discount code section and get 10% off all orders! Why he wrote his book and chose the written word rather than a modern-day type of media? Why did he pick that particular title? Does he think there is a universal definition of masculinity and what makes a good man? Where does he think men are going wrong in modern day life? Can we batch process routines? How do we build in accountability into our habits and new processes in life? How can we forgive past pain, demons, and shame? How do we know whether our change is really our true desires or coming from our ego? How can we become more vulnerable and be open with our friends, partners and ourselves? How should we stop comparing ourselves and competing against one another? How can we raise strong, healthy kids? Why does Aubrey think someone should buy a copy of his book? How to know when we are improving and getting better? What are the signs to look out for? What would he like you listening to take from this interview? Who would he invite to his dream dinner party? Who are his role models? “The basic unit of life is the day”, get one right and you can build an incredible life. “Each day is judged on it’s own accord”. Aubrey saw massive growth and transformation when he started to live his purpose rather than just live – what is your purpose and how can you start living towards it? “We are creatures of momentum”, once we start moving, it is hard to stop! “Masculinity isn’t tied to a gender”. We all have both energies inside ourselves and how we tackle the world. A man is “a force for order” a female is a “force of surrender … and creator”. “How do you know yourself unless you test yourself?”. You need pressure to learn about yourself. Lack of knowing creates insecurity that others will notice. You can always own your reaction and actions to what happens. You can own every aspect of your day and begin again when things go wrong. Stop wasting time, learn something, expand your mind and succeed. There is no excuse to waste time! We all have demons and dark impulses etc – it’s part of being human. Stop hating yourself. Be open and honest, really reflect on yourself to start going places. The motivation to change needs to come from a place of love rather than lust, fear or desire. Learn to read where it comes from and you’ll know if it’s your ego or your real desire. You will need to start the process of being open and vulnerable first, but it will be worth it. You are only responsible for your own life, effort and best, it’s all we are only really responsible for. Kids are much better mimickers than learners in the traditional sense. “It is possible to be truly happy and in your control”. You have way more than you will ever know … you will be shocked at how much potential you will have to enjoy this life. Heres the first teaser video to get you started on Owning the day! The World’s Fittest Book is set to become every fitness enthusiast’s bible. Free delivery using this link!